Before you climb up the wrong 300 stairs, let me share my favorite rooftop views in my home city. Follow my advice for the best views of Prague! Prague is one of the most beautiful and photogenic cities in the world. With its historical bridges, river banks populated with gracious swans, and labyrinths of cobblestone streets, it is impossible to avoid snapping images everywhere you go. Since I come from the Czech Republic, one of the most common questions I get is: “So, Veronika, what are the best places to visit in Prague”? I understand; Prague skyline is stunningly beautiful, and it feels like pretty much every place is worth taking the camera out for. There are many options when chasing the very best view. 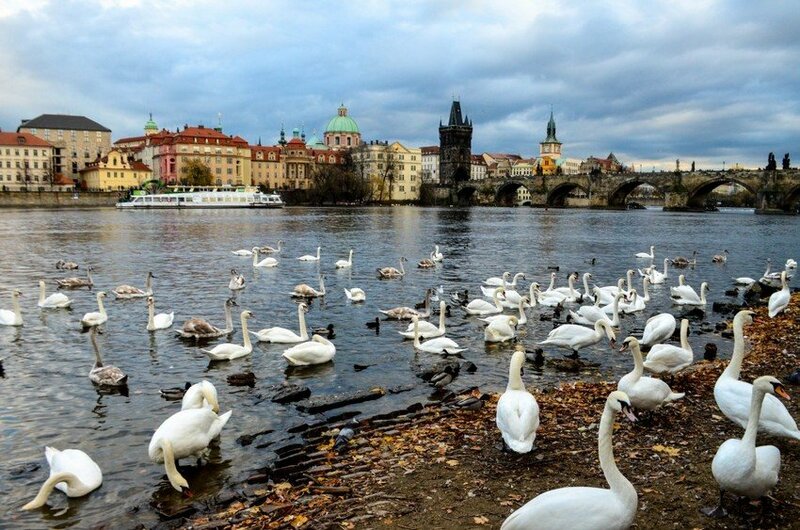 Prague is simply a paradise for photography lovers. No matter whether you are staying one day or one week, you will get some great photographs to make your stay worthwhile. In this post, I will give you some tips about the best places to visit in Prague and how to make the most of your time. 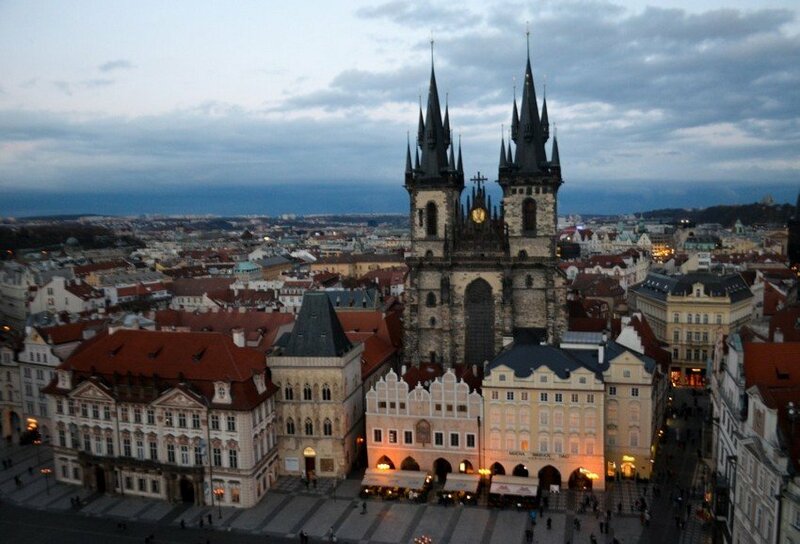 Are you planning a trip to the Czech Republic? Check out my other post Things to do in Brno featuring the best activities in the second largest town in my country. Prague is easily visited on foot, and as long as you have a map and the patience to get through some crowded places, you can visit all the major sights on your own. 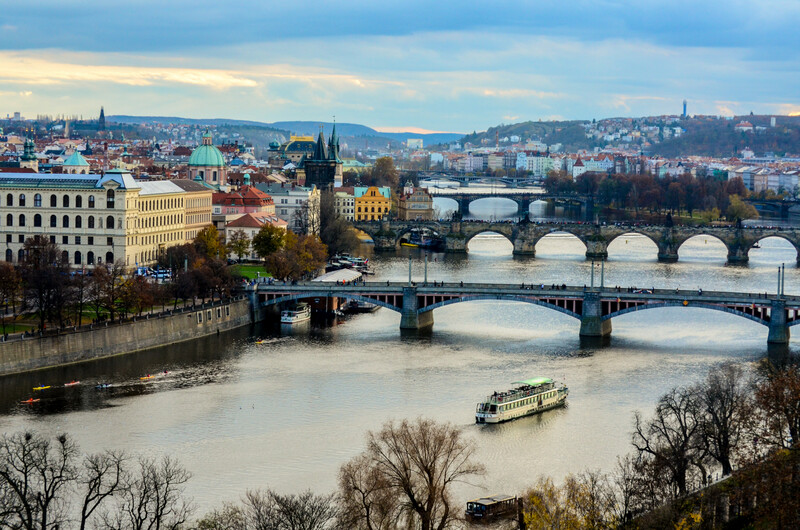 In order to save on the trance feels when visiting the monuments, you might consider getting the Prague City Card, including entrance to the Prague castle and unlimited access to the public transportation system. You can get the Prague Card valid for 2, 3 or 4-day here. Needless to say, Prague is a historic city so if you would like to learn more about the city’s colorful past, you can consider joining a guided tour. I can recommend this 3-hour guided tour since it covers many of the best places to visit in Prague, such as the Jewish quarter Prague castle. You can check the detailed program of this tour here. It is that sort of thing worth doing on the first day to get the sense of orientation. Then you can continue to explore the city on your own and make your one to one of the spots with the best view of Prague. Prague is amazing by day and even more amazing by night. If you are interested in honing your nighttime photography skills, consider taking a dinner cruise. For three hours, you can enjoy the Prague skyline illuminated by lights. Check out this great value tour which includes a dinner on board. The charm of Prague at night is amazing. If you prefer the daytime, here it is also shorter, 45 minutes Vltava cruise. Obviously, one of the best ways to get best view in Prague is to simply set the bar a little bit higher. I have made your job easier by listing the most iconic photo opportunities; these are my seven favorite locations where I go to enjoy the best views of Prague. Some are more obvious than others, but all of them guarantee picture-postcard views! Enjoy the amazing Prague skyline! 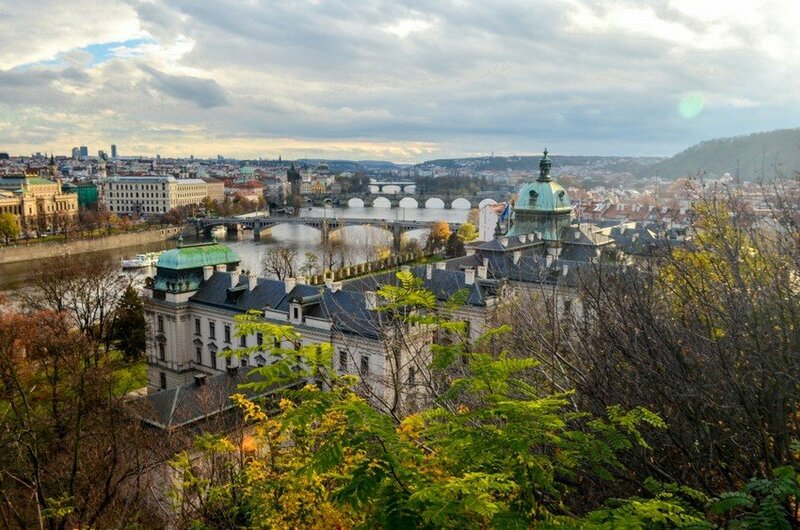 Time to get started…So here are my top-7 locations with the best views of Prague. Pick whichever one sounds most appealing to you and go for it! This is the classic view—most of the people who decide to visit the Prague castle return home with this photo. 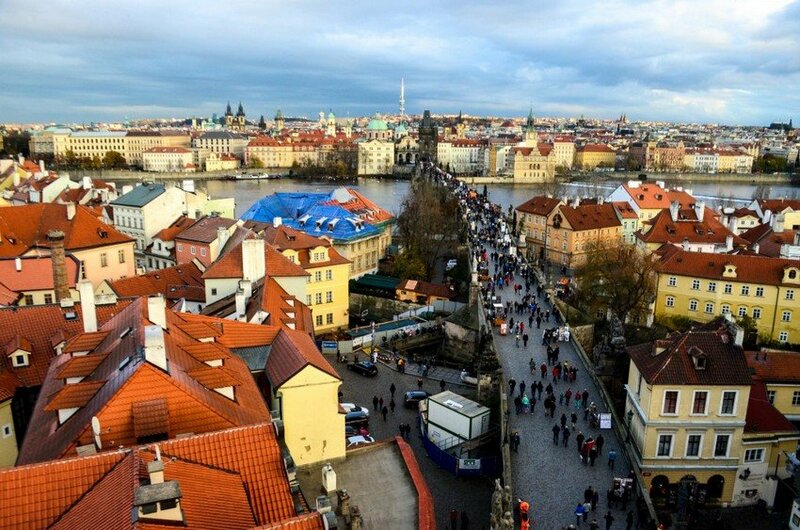 You can capture all the rooftops of Hradcany, along with views of the Vltava River and its bridges. One of the best times for taking photos is winter, when the rooftops covered in snow make it look like a scene from a fairy tale. 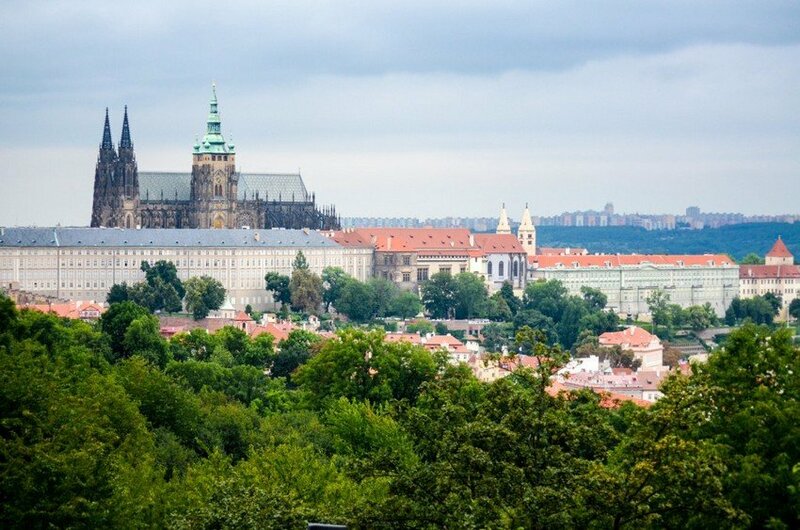 Insider tips: When you make it to the castle, it is worth exploring the inside; this tour offers great value since it includes entrance to the gorgeous St. Vitus Cathedral and Golden Lane, which are quite expensive when buying separately. Also, keep in mind that every hour on the hour it is possible to observe the ceremony of the changing of the guards at the gates of the Prague castle (free for everyone). While most people take the main path when going back down from the Prague castle, the alternative path through the vineyards is a bit of a hidden gem. 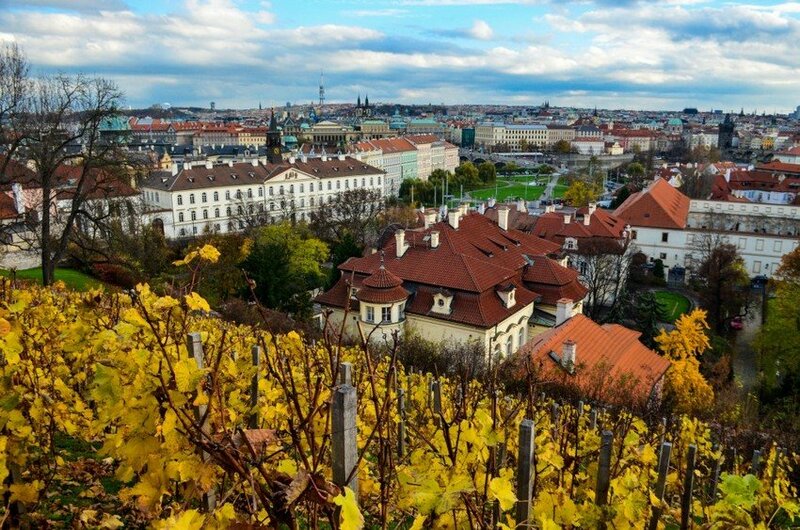 Legend has it that St. Wenceslas farmed here back in the 10th century so it is likely that it’s the oldest Vineyard in the whole country. My mother (a big fan of wine) showed me this place two years ago and I go back there every time I come back to Prague. It seems to be not yet discovered my mainstream tourism; sometimes you can see elegant outdoor parties taking place there, but even then it’s always possible to take panoramic photos with no people in your frame. It easily qualifies as one of the best views in Prague! From this park located just a few minutes from the Prague Castle (walking or by tram) you can see most of the historical center of Prague. There are two awesome spots, one directly at Hanavsky Pavilion and one 100 meters past it. Letna Park is my favorite place to go—I always get great pictures, and the park is a cool place to hang out in summer. 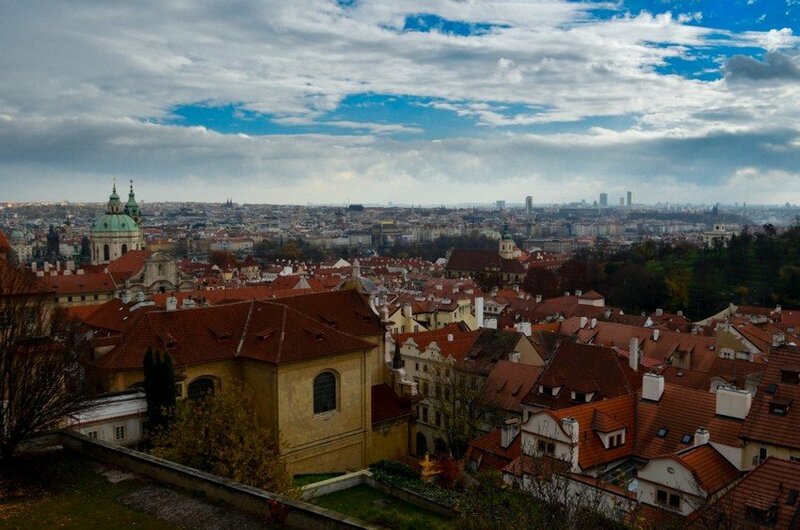 Don’t you think my photograph above qualifies Letna as one of the places with the best views of Prague? Here’s another hidden gem for photographers, who come here for yet another contender for the best view of Prague, featuring the riverside and a stunning perspective of Charles Bridge (Prague’s oldest and most beautiful bridge). Believe it or not, most people just miss this spot as the entrance is not as obvious as it could be. There is no lift and no crowds. Going up these 138 stairs is totally worth it! Sometimes the best pictures of Charles Bridge are taken from under the bridge rather on it. Really 🙂 Try to find a good vantage point on either side and get your camera ready! You can get a nice composition by including one of the bridge towers or the Prague Castle. Without a doubt, this qualifies as one of the best places to visit in Prague. One more classic picture: the tower of the Old Town Hall provides an amazing view of the square. As there is not that much space up there, you are supposed to walk around only in one direction. It tends to be the most crowded around sunset. Buy your ticket in the pink house next to the Town Hall, where the Astronomic Clock is located. Don’t worry, there is a lift! Going up Petrin Hill, you will get to see Prague from 318 meters above sea level, which makes for a great panorama. If you want to get even higher, you can climb the 60 meter-observation tower, little sister to Paris’s Eiffel Tower. Petrin Hill consists of landscaped gardens, so it is quite nice to walk around up there. Alternatively, you can take the Funicular Railway. It’s fun! From this height, some argue that it is the best view in Prague. Without a doubt, Prague offers lots of comfortable hotels to stay. 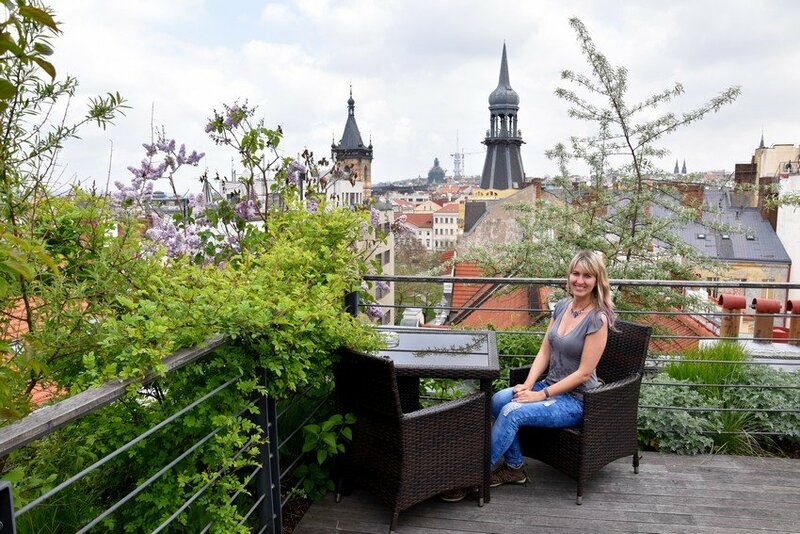 You can find the best hotels in Prague here where I share my own reviews and tips. Since I often travel to Prague on my own and staying in a hotel is pretty lonely, I opt for hostels most of the time. My favorite one is Mosaic house, an eco-friendly hostel located near the Vltava River. One can reach all the main Prague sights from there. By the way, there is an awesome view from the rooms as well! Check out rates and availability here. 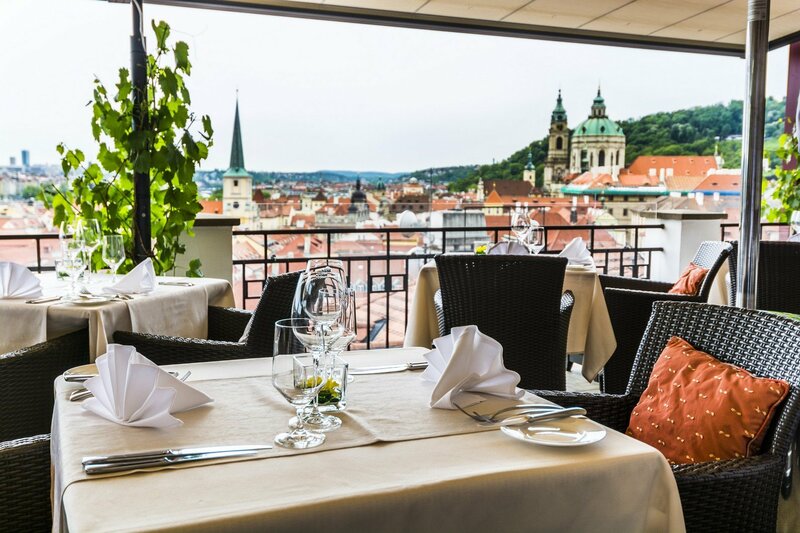 If you want to enjoy Prague skyline over a meal, you have more than enough choices. The only problem in our capital city is, many places are overpriced so you might end up easting an average meal awhile paying a lot. I asked around and collected for your couple of recommended Prague restaurants with a view, that won’t disappoint. This is one of the best places to enjoy sunset views of Prague. Terasa u Zlate Studne annually wins at Tripadvisor (reviews here), so it is definitely a highlight. The restaurant is situated in a 16th-century building and there is a place for 40 guests out on the terrace. Most tables are situated next to the railings, so you will have an easy time photographing Prague and its panoramas. This is a hidden gem situated in the vicinity of Prague castle, overlooking the vineyards. The prices are reasonable, and it is that sort of place where you can grab a coffee and cake for around 5 EUR, and the service will still be friendly. They got an amazing Panorama Pergola for their guests to enjoy. Check Villa Richter on Tripadvisor. This restaurant is located inside the Zizkov TV Tower, the Prague highest’building located in coziest Prague quartets. It’s indoor, so this is the perfect choice if you get bad or weather in Prague during your visit. Their food is tasty, and if you just want to grab a drink, you can stick with their Bar in The Sky. Reviews are here. WHAT ARE YOUR FAVORITE PLACES FOR PHOTOGRAPHING PRAGUE? Even though I come from the Czech Republic but still enjoy coming to Prague for some great photography. The city is so pretty that pretty everyone can leave with great shots. I am curious: What are your favorite places to take pictures in Prague? Would you add any locations to this list? I look forward to your comments! Enjoyed reading your post very much. I also love the view from the top of the Dancing House and also the view from the Vysehrad Castle . Great idea! I have not made it up there yet but I will next time in Prague!